We worked with CP Company to make their online retail more efficient. The results are now in and the work we did has proven to have consistently increased revenue and reduced operational costs compared to their previous supplier… and here’s why: Our approach is a lot more integrated and thorough than other agencies. We look at many factors from market trends in consumer behaviour to our clients’ specific business objectives before making recommendations. Overall UK online retail hasn’t seen a great deal of growth in the past 2 years but retail sales made using handheld devices, particularly tablets, have been steadily grabbing a greater proportion of those sales made using desktops/laptops. In many sectors handheld devices have even edged ahead of desktop as the preferred purchasing platform, particularly amongst the technology, jewellery & fashion retail sectors. The consumers’ adoption of handheld devices is an essential consideration in any business’s digital strategy and eCommerce options. With over 50% of their eCommerce sales coming from tablets & mobiles, fashion brand CP Company’s market are amongst the most connected of consumers, but the old site wasn’t optimised for mobile or tablets, so we started by putting the customer first and worked from there. We managed to identify a number of areas where a more integrated approach would quickly generate efficiencies and make savings while increasing reach. 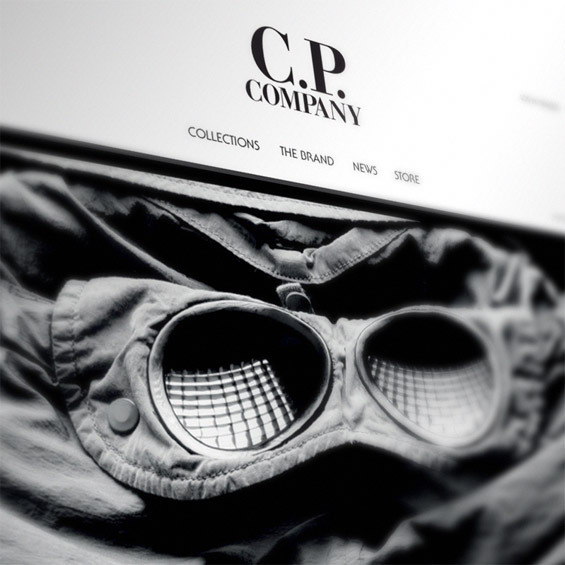 We’ve been working with CP Company since late 2013, helping develop a digital strategy for the brand aimed at increasing profits and reducing costs of their eCommerce including working with them to review some of their legacy technology which had become out of date or simply no-longer relevant in today’s cloud-based approach to business. The first tactical outcome of our ongoing relationship was the new CP Company Online Store, quietly launched in Q2 of 2014 and redeveloped from the ground-up to be a more cost-effective solution, optimised for conversion on mobile & tablet with scalability in mind. Their previous online store wasn’t catering for handheld devices and we managed to get a new, responsive, online store up and running in less time and for less money than their incumbent supplier wanted to re-skin the old site. Their new eCommerce platform is a very robust SAAS package and we customised the front-end extensively to provide additional functionality. With over 50% of the traffic to their site coming from handheld devices, the site has been developed to adapting to all screen sizes, making it much easier & faster to make transactions on mobiles & tablets. How do we know it worked? We avoided making any announcement, fanfare or special promotion around the launch as we didn’t want to artificially inflate the traffic and distort the analytics; we simply switched the sites over as we wanted to see how the new site would perform. Almost overnight there were improvements across the board, with transactions & revenue up considerably and the bounce rates down. Over the next quarter we kept an eye on the analytics which show that the site is considerably out-performing it’s predecessor for sales and our ongoing work with CP Company confirmed we have cut operational costs by a sizeable margin. What’s not to like? You consent to our required cookies if you continue to use our website. Do you also consent to the use of additional cookies?